If you are putting together an event for 2019, please contact the chamber office so that we can list it on our website. Congratulations to our new 2019 Members! Our first Community Impact Meeting was held on February 6th at Hillman Community Radio. There was discussions on how to market the town of Hillman and draw new businesses to the area. 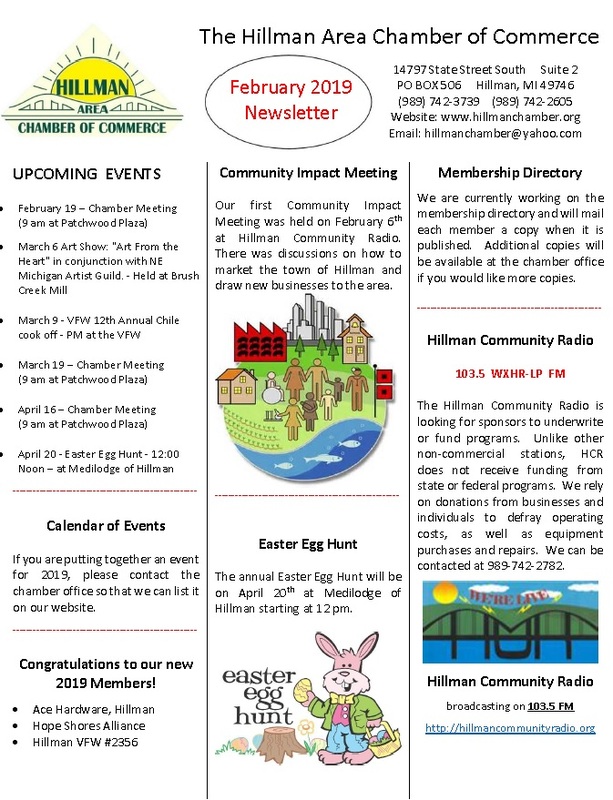 The annual Easter Egg Hunt will be on April 20th at Medilodge of Hillman starting at 12 pm. We are currently working on the membership directory and will mail each member a copy when it is published. Additional copies will be available at the chamber office if you would like more copies. Hillman Community Radio is looking for sponsors to underwrite or fund programs. Unlike other non-commercial stations, HCR does not receive funding from state or federal programs. We rely on donations from businesses and individuals to defray operating costs, as well as equipment purchases and repairs. We can be contacted at 989-742-2782. Copyright © 2019 The Hillman Area Chamber of Commerce. All Rights Reserved.